Fiskarhedenvillan is one of Sweden’s largest home-making companies. Today they deliver about 450 homes per year and have yearly revenue of about 440 million SEK (2015). Fiskarhedenvillan always strives towards delivering homes with a high quality and has developed three principles to reach that goal. The house is site-built and the villa construction kit is the hub within the process. High quality materials and top of the line craftsmanship. Co-operation with well-known and respected suppliers. Fiskarhedenvillan has developed their own concept where they deliver complete timber houses instead of wall elements. This process requires a lot of knowledge and competence within the construction field. The material for framework, walls and the roof is pre-cut after the blueprint that the customer agreed upon. A site-built home also gives the customer a lot of flexibility when it comes to moving windows, and altering space that was not within the original blueprint. Fiskarhedenvillans 39 catalog homes have inspired a lot of people but very few of them are actually built. This is because the majority of homes built are created together with the customer and thus are built to cover all the wants and needs that the customer desire. 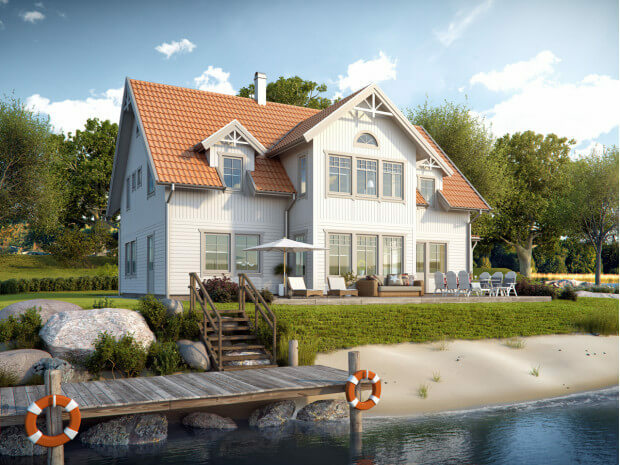 Fiskarhedenvillan also helps their customers throughout the whole construction process, from finding a suitable building plot until they are ready to move in. Fiskarhedenvillan’s relationship with Elecosoft started the year 2003 when they bought the program Statcon. This tool is now used in every construction calculation that they make. “The benefits with using statcon is that its easy-to-use and has a good graphic design. You get a clear picture of the end results and we can quickly make calculations due to the customization alternatives to fit our needs. Another strong point of the program is that is not only adapted to the Swedish market but also foreign ones”. This is stated by Mark Widell from Fiskarhedensvillan and that also adds that Statcon helps them quickly construct blueprints to entrepreneurs due to how simple it is to make qualitative calculations. In the future Fiskarhedenvillan will have its focus on expansion into new markets. About two years ago they entered the Norwegian market with good results. Their current focus lies on Finland and the home market there, where they hope that they can find equally good results.